JP1 Remotes :: View topic - At the risk of being a dolt..How do you write to the remote? At the risk of being a dolt..How do you write to the remote? Posted: Sat Sep 01, 2012 7:44 pm Post subject: At the risk of being a dolt..How do you write to the remote? I admit to being new at this, but I thought this was working ok. I got a lot of help from a lot of nice people. Emerson LC320EM8A-81.rmdu that was kindly sent to me and supposedly had the few codes I need to put in the ReplayTV 5000 remote so it can turn the TV on and off and do volume and mute. I click on the above file and Remote Master opens. I tell it what kind of remote I am using, and then I have to open that emerson file again. No problems. I saved the file and it saved it over the emerson file, so I saved it again after I selected the ReplayTV as remote type. I read through the WIKI. For the life of me I can't see how to write the new file to the remote with my hand made JP1 cable. The wiki implies to use IR but I have RM IR. I think that might be the same but you know, I am pretty literal about all that. So I looked in RM IR and I don't see a way to load the file I made with Remote Master, if that's the procedure. And how do I write it back to the remote? The wiki doesn't really mention that. Unless I am missing something, or I actually need something called IR and that's what does it. There don't seem to be buttons or menu selections on Remotemaster or on RM IR that say anything like "write to remote"
I am doing this now because I am at the location where the Sylvania tv is so I can test it. OK, I kept looking, and I found an IR v8.03. It does seem to write to remotes. So things are looking up. I have the RMDR file that I made with remotemaster by selecting the ReplayTV 5000 and loading the Emerson file. But IR won't open it. Wow. OK, I read through that, and I think all that is discussing is beyond the scope of my goal here. Rob, that is a very comprehensive document. I really don't need to load any extenders, remap anything, nothing like that. I just want the replaytv remote to be able to turn the tv on and off and volume/mute. I have the remote plugged into the cable on the parallel port. If I could do what I need I would try it. If I have to learn to do all these comprehensive changes before I can address my admittedly simple needs, I don't think it's worth my time. Better to keep the OEM remote laying there. I'll agree that a lot of the wiki is very outdated...and even the link Rob gave is pretty outdated too, but it's really not that complicated, and even being outdated there's enough information to figure out what you need to do. If you spent hardly any time at all trying to figure this out and didn't happen upon either of those things, then I just don't know what to say. Thanks for helping, I really do appreciate it. Emerson LC320EM8A-81.rmdu. It was posted here. In RM IR, I click open. I pick the device upgrade file. The file opens but in Remote Master, which does not upload to remote. So I can't open the file I have in RMIR. Do I have the wrong file? That's the file I have. I am stopped. So there is something I am missing? I am not usually unable to do this kind of stuff, I mostly have no problems. But since the needed file seems to like Remote Master not RM IR, well, I read through those wiki pages and I didn't find anything about this. The file I have is for RemoteMaster, not RMIR. Is it a file format problem? Did I miss something? Or is this something where I am expected to know something that I just don't and haven't been able to find out? Start RMIR and attach the cable to your remote. Since you're using a parallel interface, go to Remote\Interface and select JP1 Parallel. Click on Download From Remote, either via the Remote menu item, or with the down arrow icon. This should result in a display of the current state of your remote, with tabs labeled General, Keymoves, Macros, etc. Click on the Devices tab, and click New. In the daughter window that opens, click Open and select the Emerson file. Once that is arranged correctly with the functions assigned to buttons, click OK. Check on the General tab to make sure that you have assigned the setup code you've chosen for the upgrade to a device button. Then click on upload. RemoteMaster and RMIR are the same thing... Here's the run down. Basically, there are two steps involved in all of this mumbo jumbo of working with your remote. You have (A) creating an image that represents all the programming, protocols, etc, etc, etc for your remote and then you have (B) uploading those images to your (or downloading them from it). Originally, the program IR was what took care of (B)...that was its main and only real purpose. To take care of (A), you originally used Keymap Master which is common called just KM. Later on, Remote Master was developed. Originally, all it did was (A) as well. As it grew though, they started to add more and more functionality to Remote Master. Eventually, they added the ability to do (B) to Remote Master as well...since it was doing Remote Master + IR, the name became RMIR as it is commonly known today. 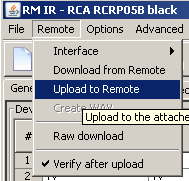 So nowadays, all you need is RMIR...you don't need just "Remote Master" and you don't really need IR for most tasks. You will also want to pay attention to the "Device Type" and "Setup Code" (highlighted in the green boxes); we will need those later. Voila! RMIR should upload the modified image to your remote and you should be good to go. You should be able to unplug the remote, hit the device button you chose, and control your device. If not, post .rmir file and let us know what you did and what happened (and/or didn't happen). Now I see the problem! RMIR opens files with the extension .rmir, RM opens files with the extension .rmdu. RemoteMaster contains both RMIR and RM applications. Here's how you add a .rmdu file to your remote using RMIR. Open RMIR. Download your remote to it using the Download button. You should now see a collection of tabs, one labelled Devices. Move to the Devices tab and press the New button at the bottom. 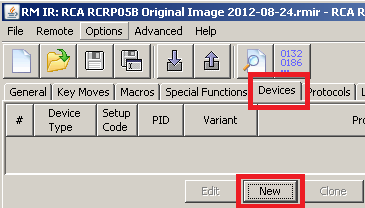 This opens the Device Upgrade Editor in a separate window, looking very much like RM but you are still in RMIR. Press the Open button at the bottom left of that editor and open your .rmdu file. That loads your upgrade. Now press OK, which adds the upgrade to the list (which might have been empty, depending on your remote) in RMIR and closes the editor window. NOW you can upload to your remote with the Upload button. That's the very basics. You might want to save the contents of your remote (a) before you add the new upgrade, and (b) after you add the upgrade but before you upload it. Use the File/Save As menu option, which saves the remote's contents as a .rmir file that you can later re-open in RMIR. Edit: Ah! While I was writing this, I see Vyrolan told you the same thing but with pictures. Never mind, I'll leave this post here anyway. Well we've sure beaten this horse to death! Good stuff for beginners though, especially for the history and terms...is it a candidate for the sticky? Well, that is sure a lot clearer. So I don't need remote master at all now? Because I have a start menu item created by setup.vbs that includes that and RMIR. And I just tried that download from remote, it chugged and chugged and never ended. I exited RM IR but I cannot exit Remote Master. It's maybe crashed? It's tabs and about work but exit is not responsive. The red close X clicks but does not exit. The exit does not exit. So I dunno. I just killed it with taskmanager. I clicked RM IR in the start menu again and RM IR opened. I clicked download from remote again, but it doesn't seem to complete. The check interface says that works but I realize that may not be reliable. One thing that became clearer was that we are working with images, I kind of got the impression that a standard unprogrammed remote was loaded when I told the system what kind of remote I was targeting. That may not be true. I understand it is necessary to download an image, work with it and put the whole thing back now. What remote are you trying to download? Do you have a link to the schematic for the hand-made JP1 cable? We need to know the answer to these questions to move forward. I just exited the RMIR program again. It didn't do the download successfully. The remote is a Replay 5000. To make the cable I used the instructions from this site, an 8 page or so pdf doc by tommy tyler (I think) though I can't find it right now. Hmm. Now why couldn't I find that? Google knew. I did the check interface and that was successful, but I realize that only checks the diode and is not a comprehensive check. I have batteries installed. It did not work. I took a battery out. Tried again with RMIR and it's chugging. Nothing happening. I quit that and ran IR.exe. I did the check interface and it said "Privileged Instruction". I put the battery back in that I had taken out and now IR.exe says successful interface check. I tried download from remote with that and it says "There is an address conflict at 000E. Do you want to replace the fixed data?" I have no data on the tabs of IR.exe, so it seems that didn't work either. This is a desktop computer, an old HP with a parallel port onboard. Just for the sake of completeness, could you also download IR.exe and see if that is able to download your remote. Note, the R5k is a traditional EEPROM based remote with a 1k EEPROM.